Receiving a call from his irritated mother asking him to buy wood glue to fix a door shutter or find a new place to live, Jeff boards a bus, where he sees a kid wearing a sports jersey bearing the name Kevin. He follows Kevin (Ross) to a basketball court, where he joins a pick-up game and the two bond. Jeff agrees to smoke weed with Kevin, but discovers he has been tricked when he is beaten and mugged. He happens upon a Hooters restaurant where he crosses paths with his older brother Pat (Helms), a successful yuppie struggling with a failing marriage. Pat's wife Linda (Greer) is spotted at a gas station across the street with another man. Jeff and Pat spend several hours following them, first to a restaurant and later to a hotel, with Pat's new Porsche being ticketed, crashed and eventually towed away at various points in the journey. The brothers also visit their father's gravesite and fight over their conflicting life philosophies. Jeff sees a truck reading "Kevin Kandy" and runs off to hitch a ride, only to end up at the same hotel where Pat has found Linda in a room with another man. Jeff offers to break down the door. The man is a co-worker of hers named Steve (Zissis). Linda quickly ushers Steve out and then confronts Pat about his role in their problems. Frustrated, she leaves, saying she will move in with her mother. Jeff and Pat reconcile. Jeff explains how he is struggling to find his destiny in life, while Pat admits he wants to fall in love with Linda again and for her to do the same with him. Jeff encourages his brother to tell her that, and they hail a taxi to pursue her. Interspersed within the main story is the story of Sharon, who is at work, frustrated with her unfulfilled life and dissatisfaction with her sons. The doldrum is interrupted when a paper airplane with a beautiful drawing of a flower lands in her cubicle, followed by an anonymous co-worker claiming in an instant message to be a secret admirer. Sharon spends the day trying to deduce the identity of her admirer. She confides her frustrations to colleague and friend Carol (Chong), revealing that she has not dated since her husband's death. Carol encourages her to warm up to the attention she is receiving. Sharon is surprised and confused when the admirer turns out to be Carol herself, and though neither believe themselves to be attracted to their own gender, Carol appeals to Sharon's desire to become close with someone who truly understands her. At that moment, a fire alarm goes off and ceiling sprinklers activate; this is an enlightening moment for Sharon who sets off with Carol on a spur of the moment trip to New Orleans. Jeff, Pat, Linda, Sharon, and Carol all converge on a bridge, where they are stuck in standstill traffic. Pat exits the taxi and runs through the traffic to tell Linda how he feels, passing Carol's car; Sharon sees her son and runs after him, followed by Carol. As Jeff muses to the cab driver about seeking out his destiny only to find it isn't very exciting, he observes a helicopter flying overhead, jumps out of the taxi and also runs through the traffic, passing Pat, who was sharing his feelings with Linda when they were interrupted by the arrival of Sharon and Carol. Jeff continues onward to discover that the cause of the traffic is an accident in which one car plummeted over the side of the bridge. He dives into the water and rescues two children and their father; when Jeff then fails to resurface Pat dives in and rescues him. The group reconciles after the ordeal, and the audience sees Sharon celebrating her birthday and Pat and Linda apparently faring better in their marriage. Jeff sees a news report about his heroics and learns that the father of the kids he rescued was also named Kevin; now with a sense of purpose, he grabs some wood glue and fixes the door shutter. The film grossed $840,000 in its opening weekend. Jeff, Who Lives at Home grossed $4,269,426 in North America and $435,331 elsewhere, for a worldwide total of $4,704,757. On Rotten Tomatoes, the film holds an approval rating of 78% based on 132 reviews, with an average rating of 6.7/10. The site's critical consensus reads, "Sweet, funny, and flawed, Jeff, Who Lives at Home finds the Duplass brothers moving into the mainstream with their signature quirky charm intact". On Metacritic, the film has a normalized score of 60 out of 100, based on 36 critics, indicating "mixed or average reviews". Roger Ebert of the Chicago Sun-Times gave the film three stars out of four and described it as "a whimsical comedy [that depends] on the warmth of Segel and Sarandon, the discontent of Helms and Greer, and still more warmth that enters at midpoint with Carol (Rae Dawn Chong), Sarandon's co-worker at the office." He concluded that "it's not a Feel Good Movie, more of a Feel Sorta Good Movie." Peter Travers of Rolling Stone also gave the film three stars out of four and described it as "funny, touching, and vital", praising the Duplass brothers by saying that "their films hit you where you live." 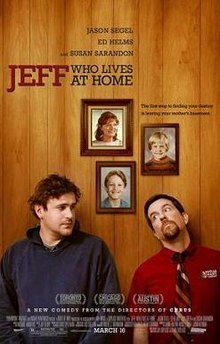 Jeff, Who Lives at Home was released on DVD and Blu-ray on June 19, 2012. ^ "Jeff Who Lives at Home". Dark Horizons. Archived from the original on 14 December 2013. Retrieved 14 December 2013. ^ "Jeff, Who Lives at Home". Box Office Mojo. Archived from the original on 2016-08-28. Retrieved August 22, 2016. ^ DeFore, John (14 September 2011). "Jeff, Who Lives at Home: Toronto Film Review". The Hollywood Reporter. Archived from the original on 2011-09-23. Retrieved 15 September 2011. ^ ‘Hansel & Gretel: Witch Hunters’ Delays To 2013 So Jeremy Renner More Of Global Draw Archived 2012-01-10 at the Wayback Machine Deadline Hollywood (January 9, 2012). ^ Loeb, Steven (20 October 2011). "Review: 'Jeff, Who Lives at Home' Is an Ambitious Comedy". East Hampton Patch. Archived from the original on 21 October 2011. Retrieved 2 November 2011. ^ a b "Jeff, Who Lives at Home (2012)". Box Office Mojo. Amazon.com. Archived from the original on 2012-06-16. Retrieved June 27, 2012. ^ "Jeff, Who Lives at Home (2012)". Rotten Tomatoes. Archived from the original on 2012-04-28. Retrieved April 30, 2012. ^ "Jeff Who Lives at Home". Metacritic. Archived from the original on 2012-04-15. Retrieved April 21, 2012. ^ Ebert, Roger (March 14, 2012). "Jeff, Who Lives at Home". Chicago Sun-Times. rogerebert.com. Archived from the original on 2012-06-06. Retrieved June 7, 2012. ^ Travers, Peter (March 15, 2012). "Jeff, Who Lives at Home". Rolling Stone. Archived from the original on 2012-06-16. Retrieved June 7, 2012. ^ Katz, Josh (May 1, 2012). "Jeff, Who Lives At Home Blu-ray". Blu-ray.com. Archived from the original on 2012-05-13. Retrieved June 7, 2012. This page was last edited on 15 March 2019, at 23:00 (UTC).